The easiest way to purchase a Sioux Tipi by Gray Wolf Trading is simply to select one of the Tipi Packages listed below. In a few easy steps you can select your Tipi Package. Choose either the 10 oz. or the 12 oz. Sunforger Marine Finish Boat Shrunk Canvas. This is treated to meet CPAI-84 fire codes. That's it! Included in your package is the Tipi Cover, Door, Lift Pole Rope, Lacing Pins, and Stakes. You will also receive the free video "How to Setup Your Tipi" that will take you through the steps for a fast, effective setup. Poles are not included in the package but are available and can be shipped to you. Each tipi can be custom painted with the design of your choice. Call for a price estimate. Tipi Liners and Tipi Covers are available on the Liners and Covers page. Additional items are available at the Tipi Accessories page. 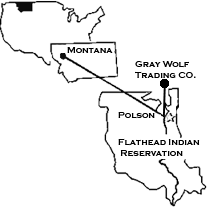 Remember that if you have any questions about selecting the right one, simply use one of the methods below and contact Gray Wolf Trading.